The MCCVB provides resources to help you every step of the way and are happy to assist in making your event a success. 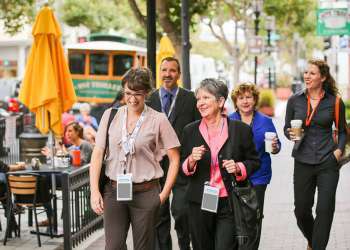 Tap into our other services, such as staffing at on-site events, delegate housing services, welcome programs, dine around planning and access to community resources. Email Sales@SeeMonterey.com to request these services and one of our Strategic Client Service Specialists will contact you. Download our Strategic Client Services brochure. *Meeting size requirements apply to receive these services and are subject to change. View the "Staffing Assistance" section below for more information. For qualifying groups, we offer complimentary registration staffing and an Attendee Welcome Table at your event. See details below. *Note: MCCVB must have been included in the sourcing of the RFP for the program being staffed. MCCVB has chosen to partner with MeetingMax to provide you with a user-friendly system that will streamline and manage your event reservations. For groups of 450 or more peak rooms for two nights utilizing three or more hotel properties we offer housing services. This online reservation system allows attendees to be able to view all hotels within the block on one website. The system also gives planners access to real time reports and event pickup information (subject to change). Contact us at Sales@seemonterey.com to request welcome program services for your citywide event including letters from our CEO or city officials, signage at our airport or to help arrange room drops. We can connect you with local contacts for information on city permits for events at Custom House Plaza and contacts for parking information or street closures. Arranges and approves installation of banners and signage for groups arriving at the airport. Assists with permits for events at venues within Custom House Plaza in downtown Monterey. Assists with permits for auto events, street closures and buyouts of street parking or city lots.